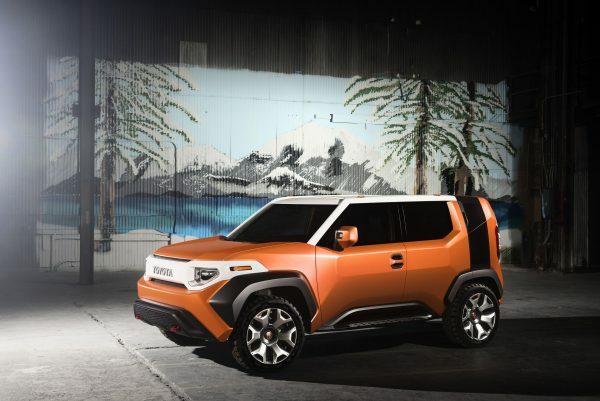 Toyota has reincarnated the spirit of its FJ LandCruisers and other iconic adventure vehicles with the world premiere of the FT-4X Concept at the New York auto show. 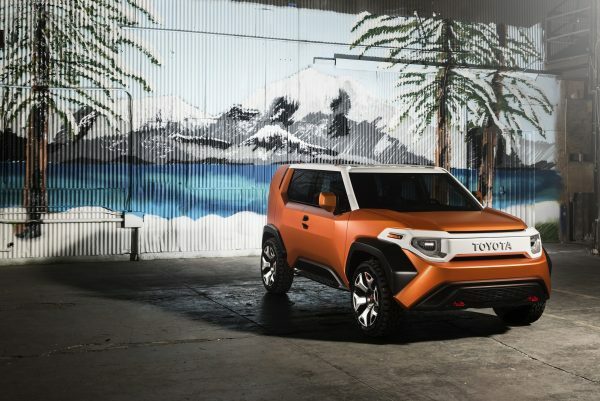 The revolutionary Toyota FT-4X – or Future Toyota 4WD Crossover – is a four-wheel-drive toolbox penned by Toyota’s Calty Design Research studio in California. Featuring compact, sturdy dimensions, the “rugged charm” design of the FT-4X places value on simplicity, capability, durability and Toyota lineage. Calty president Kevin Hunter said the FT-4X demonstrated that designers continually invested deep thought into the emotional connection with their cars. “The FT-4X is not simply a concept where style meets function; it is a thoughtful, charming and engaging experience that adds real pleasure and convenience to the journey,” Mr Hunter said. Based on the Toyota New Global Architecture C-platform, the FT-4X is inspired by a simple, sturdy “X theme”. At the sides, a vertical X is shaped to provide the widest point at the door handle, creating a natural protective zone for the occupants. A similar treatment is used for the tailgate. Designers also developed a horizontal X theme that accentuates the rugged 18-inch wheels at each corner of the vehicle. Innovations abound throughout the vehicle. 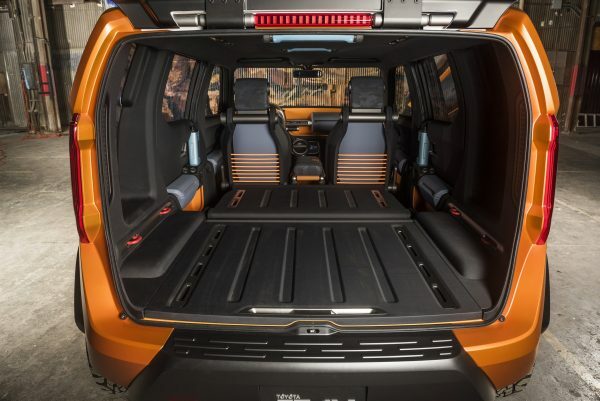 The Multi-Hatch tailgate, opens two ways: in urban mode, a horizontal opening splits the hatch in half and makes it easier for kerbside loading of gear. In outdoor mode, the one-piece door opens upwards to create a shelter from the elements. The rotatable tailgate handle is shaped so it can be gripped by a gloved hand. Twin red hooks in the front and rear bumpers provide secure anchor points for vehicle recovery and for tying down loads. Generous approach and departure angles add to the vehicle’s prowess. Wide black-painted over-fenders lend a tough look to the exterior and engulf the beefy, custom 225/55R18 Goodyear® all-season tyres. A vertical picture window set above the driver’s side rear fender can be removed and swapped with multiple opaque colour or tinted class options, allowing owners to personalise their FT-4X. Sculpted rocker panels enhance underbody protection and durability while a GoPro® HERO5 Session™ camera, built into the driver-side rear-view mirror, captures off-road action. At the centre of the nose is an extra-large embossed TOYOTA logo that’s flanked by bright LED headlights. The FT-4X interior presents a large accessible space for equipment with blue colouring for closed storage and orange for open storage. Twin boxes in the cargo area – one warm, the other cold – are designated for functions such as storing snacks, warming gloves or cooling ice-packs. A flat cargo floor is fitted with tracks for securing gear and conceals a deep storage compartment, which can be accessed by sliding the floor out. Ahead of the cargo zone is a wet zone for stowing damp clothing or muddy boots while front passengers sit in a clean zone. Rear-door armrests have USB outlets and big, rotatable window switches; front and rear door handles serve as water bottles; removable inside rear lighting doubles as a torch; and the dome light can serve as an exterior locator or beacon. An ultra-compact The North Face® sleeping bag fits neatly between the front seats and functions as an armrest above an extra-large dividing console with more storage space. Its breathable, high-grip, hybrid mesh surface allows for wet items to dry quickly while its bungee cord lattices keep small items in place. The blue and orange storage themes continue in the dashboard with a larger blue chest that appears to float above a carved orange bin. A removable multimedia system is part boom box and part in-dash stereo, engineered with an extra-large handle grip. Although there is no traditional navigation screen, designers included a mobile-phone mount directly above the cylindrical digital instrument cluster – a concept that recognises that users are used to relying on their own devices for directions. Although a concept, the FT-4X could potentially employ a punchy, small-displacement four-cylinder engine combined with its mechanical 4WD, selectable low range and front MacPherson strut suspension and rear double wishbones. Calty chief designer Ian Cartabiano said the mechanical satisfaction of the concept’s tactile grips, handles and controls are in contrast with today’s digital world.